Grab them while you can!! What, you are wondering? Gorgeous cherries for Cherry Pie. On July 4th I was planning to make my Red White and Blue Pie. It made sense, don’t you think? Until…. I was in the grocery store and walked by containers of beautiful deep red cherries. I knew at that very moment what I was going to do. My pie was red white and blue but layered blue red and white, because the cherries were cooked and placed between the blueberries and the whipped cream. Everyone at the table raved about the cherry layer and so I decided, then and there, that my next pie was going to be a Cherry Pie. 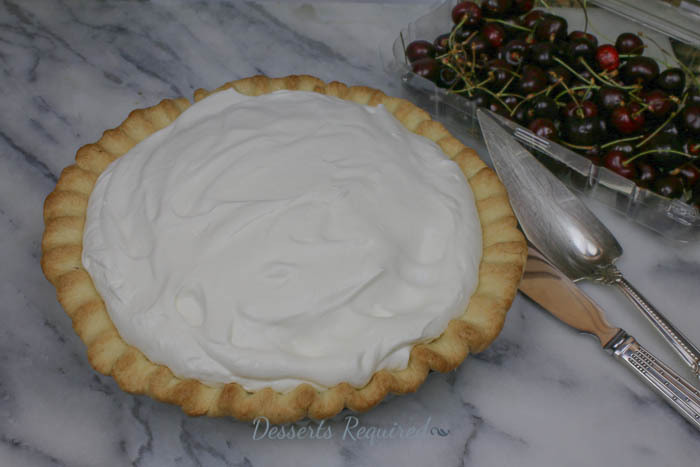 While the pie crust was resting, I made the cherry filling. Shoshana was recruited to pit the 4 pounds of cherries. The trick to making life easy when pitting, other than recruiting someone else do it for you, is to wear plastic gloves and use a cherry pitter. When you pit the cherries, do this inside a plastic bag so the mess is contained. I chose to brush the crust with a thin layer of dark chocolate to seal the crust and prevent the cherries from making it soggy. White chocolate or your favorite flavor of jelly would work just as nicely. It is a personal choice. 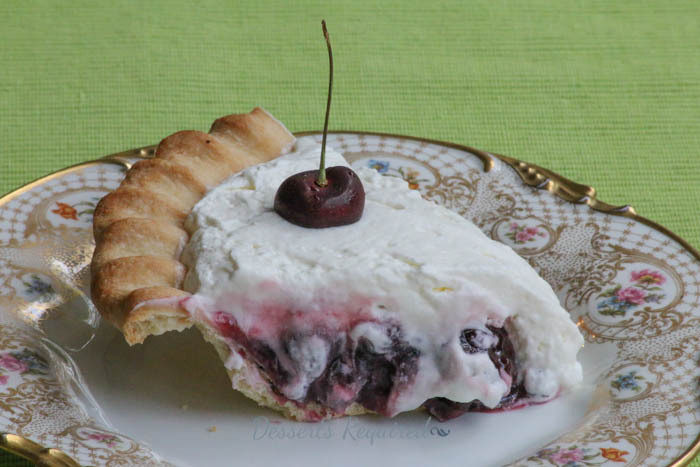 A layer of whipped cream is put on top to complete the heavenly goodness of Cherry Pie. I love serving Cherry Pie once it is very cold. Just remember, cherry season is short; hurry so everyone at your table can say, ‘Hurrah’. That is, once they slow down enough to talk! Combine the flour and sugar in a food processor fitted with a metal blade and process until well combined. Cut the butter into 11 pieces and add the butter to the food processor. Pulse on/off until the mixture resembles coarse meal. Add the ice water 1 tablespoon at a time, and pulse on/off until the dough forms a ball. Remove the dough and form a disk. Wrap in wax paper and refrigerate for at least 1 hour. Preheat the oven to 400°. Set aside a deep dish 9" pie plate. Roll the dough out on top of two pieces of wax paper, keeping a sheet of wax paper on the top of the dough, so your rolling pin is on the paper not the dough. After each roll, rotate the dough and lift the paper. Roll the dough to a diameter of 12”. Place a piece of aluminum foil in the pie plate and add pie weights to the foil. Bake at 400 for 14-16 minutes, until the edges are light brown. Remove the pie weights by lifting the foil out of the pie crust and bake an additional 8-12 minutes, until the pie is nicely browned. If necessary, prick the crust again with a fork. Remove from oven and cool completely. Remove from the oven and cool completely. Once the crust is cool, brush the crust with the chocolate. Refrigerate until ready to fill. Pit the cherries. Place the cherries, sugar and cornstarch into a medium size saucepan. Cook over medium heat until the mixture is thick, 8-10 minutes. Cool completely. Transfer the filling to the pie crust. Refrigerate. Transfer to the top of the cherry filling and smooth the top. Refrigerate until ready to serve and serve cold. To pit the cherries, wear rubber gloves, use a cherry pitter and pit the cherries into a plastic storage bag. The mess stays in the bag and your hands are not stained for days! Additional time is needed for the dough to rest and the crust and filling to cool. I haven’t eaten breakfast yet. Now that I have seen this magnificent pie, cereal has NO appeal at all. The photo says it all—-DELICIOUS. Thanks so much!!! No need for a formal breakfast when fruit will work just beautifully. Fruit that is in Cherry Pie, of course! love a good cherry pie! has to be one of the best pie flavours around.. i am so craving a slice right now! I agree. There is something about cherries that makes want more!! I love happenstance things when ideas are born from dish reviews or dictated by what’s in the grocer’s aisle. Beautiful crust, Betsy, and I adore lining it with chocolate. Brava! Very helpful tips, dear Betsy. Genius to coat the crust with chocolate to prevent sogginess. 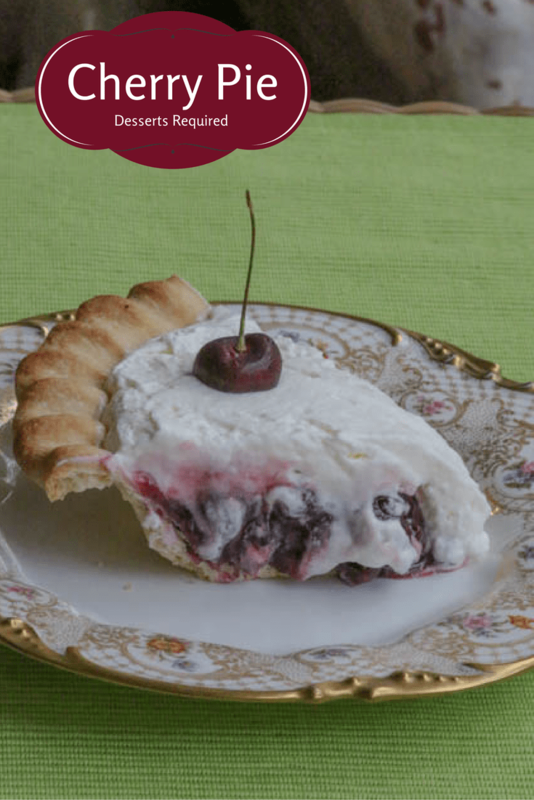 And appreciate the suggestion on keeping kitchen mess to a minimum…Last and not least, very grateful for this scrumptious cherry pie recipe! Thanks so much! I love what coating the crust does…no more soggy crusts for us! !